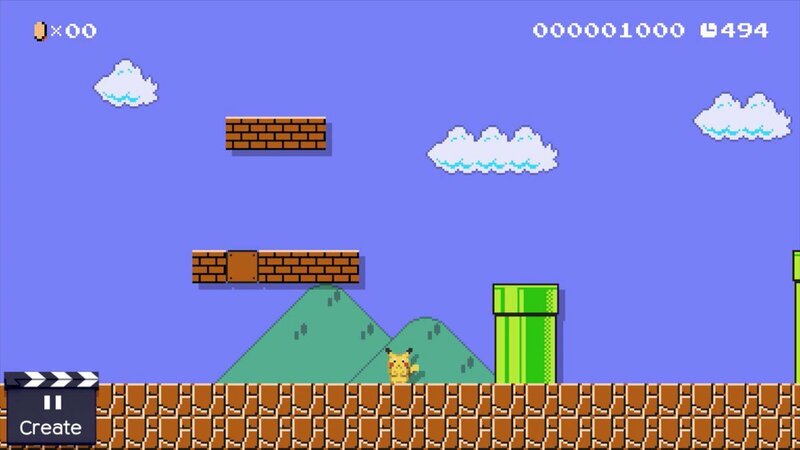 Super Mario Maker is a custom creator game where you can create various 2D Mario stages and share them online. These come in four different styles based on the mechanics and aesthetics of 4 different Mario games: Super Mario Bros., Super Mario Bros. 3, Super Mario World and New Super Mario Bros.
Pokémon, however, has a small element within this game. The Mystery Mushroom is a unique item available only in the Super Mario Bros. style. With this item, you can set it to be a specific character out of 153 different options. 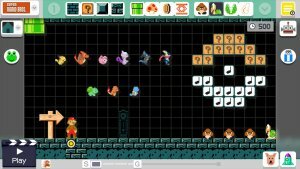 The first 100 numbered costumes can be obtained by beating the 100 Mario Challenge mode where you play multiple fan created levels with just 100 lives, but can also be obtained by scanning the respective amiibo. From the outset, there are just 6 Pokémon to choose from, but unlike most of the Costume options, they lack any unqiue sound effects. Event Stage - I Choose You! On February 12th 2016, a special stage was added to celebrate the 20th anniversary of Pokémon. This stage, titled I Choose You! had players go through a Mario style remake of Professor Oak's Lab and given the choice of 3 Pokémon: Bulbasaur, Charmander or Squirtle. The path to the end of the stage varies depending on the Pokémon you pick with a focus on the type of that Pokémon. When you finish the stage, you will then receive the special Mystery Mushroom outfit of the Pokémon you chose. Unlike the previous costumes, these have special sounds when you jump, pose and finish stages with the Pokémon.